I thought I would post a picture of my garden since it is in full bloom. 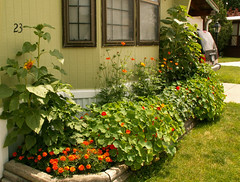 I have nasturtiums in the front, the tall ones are sunflowers, and the little orange ones are marigolds, of course. The tall spindlely ones are cosmos.